It had been three weeks since Tinahime’s 2001 Chevy “Crapollier” had died on her. During this time the local Japanese Car dealerships have been feeling the backlash from Toyota’s recent tarnish to it’s long standing reputation. As a result, many of the other dealers have been offering zero down incentives on new purchases. Well we are not in the best of shape with me out of work and all but on a whim we thought ‘well what if we towed the “Crapollier” to a dealership and see if they will sell us a car with our credit and take this American POS off our hand.’ At first I wasn’t too optimistic given that in December of last year we were turned down on financing a $700.00 flat screen TV. But low & behold, they flew Tina’s credit and let her drive off the lot with a new 2010 Honda Civic on her credit and took the “Crapollier!” And to think Paul’s TV didn’t think she was good enough for a TV! ばか! Well that was Saturday and now Sunday morning had arrived. 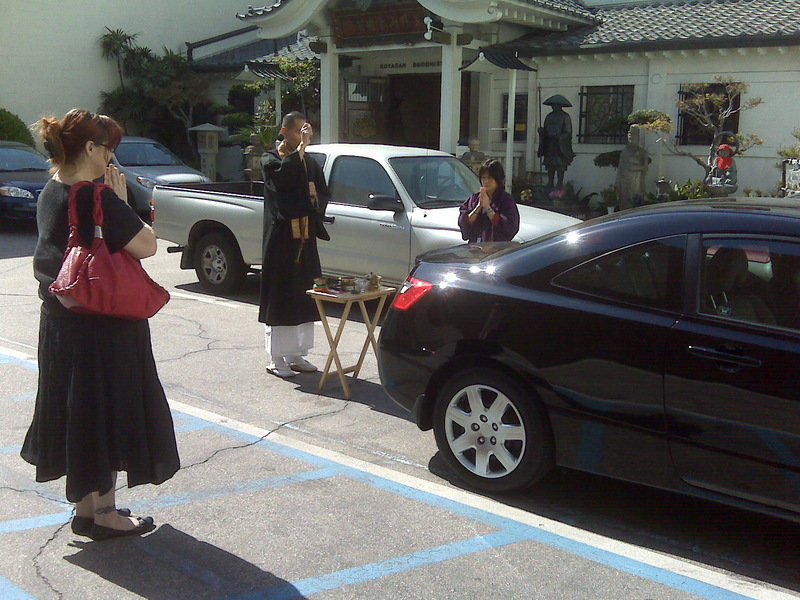 Usually we take my poor 1994 Honda to Little Tokyo to attend our Buddhist Temple and Aikido class afterwards. 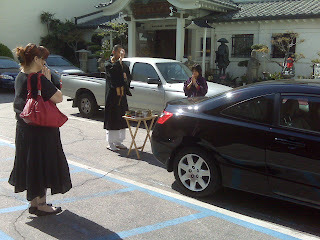 On a whim I suggested to Tinahime that she might want to ask Koyagami Sensei or Asahi Sensei if the Koyasan Buddhist Temple in Little Tokyo offered such services. Well, I figured that since they blessed my Iaito Sword and I know they offer much of the same services as the Shinto Shrine does, why not ask! Sure enough they do and without hesitation they went right to it after morning service. I figured that if she is going to get stuck with those car notes you might as well do what you can to make sure this car lasts her. 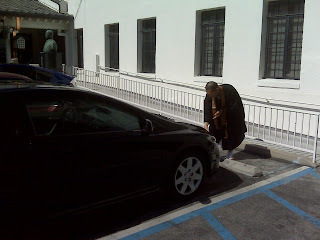 With a Buddhist Blessing she can't go wrong. Not too many people are aware that the Temples offer such services. Even to some of our own regulars there thought this was a good idea and if it is a good Japanese Tradition there, it certainly is here too. 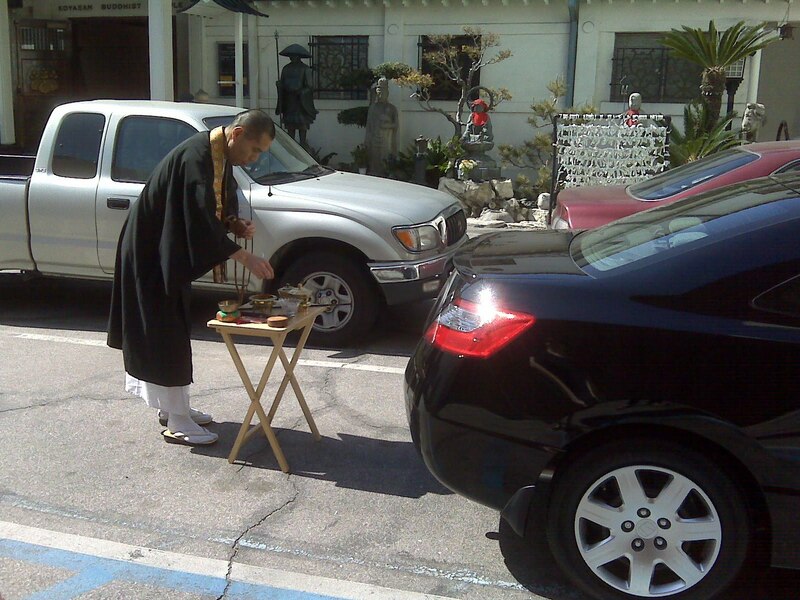 Several incantations and prayers were offered by both Asahi Sensei and Koyagami Sensei as incense burned followed by the recital of the Heart Sutra which was done three times. Then they did a further blessing for the owner and concluded the ceremony with a Buddhist protective amulet to be presented to the owner. They ask for a small donation as any other temple but it is well worth it. I wish Tinahime all the best with her new Honda Civic. 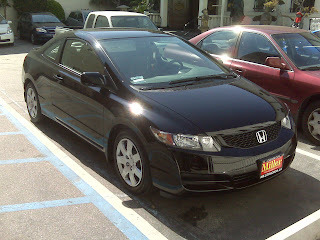 I know my old Honda Civic has been the most reliable car I have ever owned. Who knows if my books ever get published or my films ever get made I'll be able to do the same thing but until that time I'll have to settle for the passenger seat with an a/c in her new cool "kawaii" mobile. She is already in love with it and has become overly protective of it. In fact she has become so protective I might have to change her name to Hondahime! なんちゃて! Very cool. I have a Buddhist protective amulet as well that I got back in 02/03 trip to Japan. It's been in my car ever since and seems to work. No accidents.